A newly refurbished Shepherds Hut, equipped with a small kitchen with a gas hob, running water, fridge and kettle. Open the double doors and look out onto beautiful panoramic views of the Herefordshire countryside. If the weather is cooler light the wood burner and snuggle down in your luxury cosy double bed. We'll also provide you with a complimentary pack of Mason & Miller toiletries and a welcome pack of local goodies. 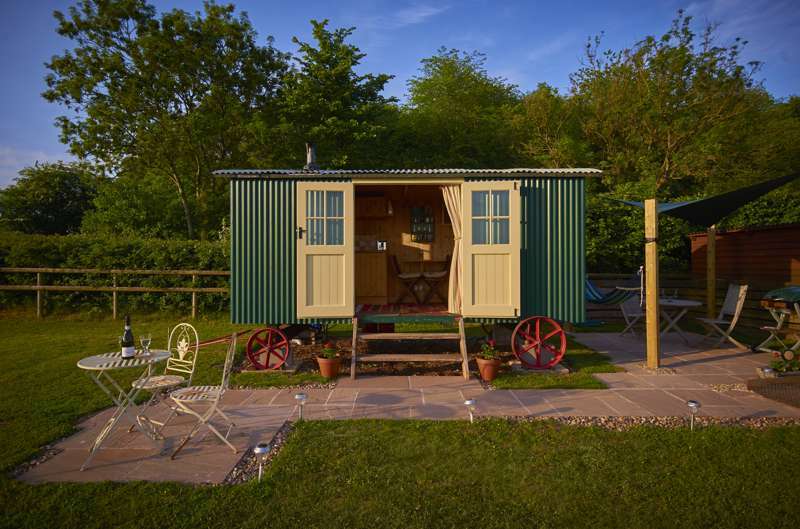 Have you ever fancied a luxury Glamping break in a shepherds hut. Our brand new hut ticks all the boxes. It's fully connected to mains electrics and water and even has a flushing loo, yet it's in a field location so you feel off grid but you're not! Bring your bikes (bike store available) and after a days biking or hiking enjoy a relaxing sauna in your own Zoki sauna adjacent to the hut. After the sauna, pick up your favourite book and indulge in a chapter or two before supper. 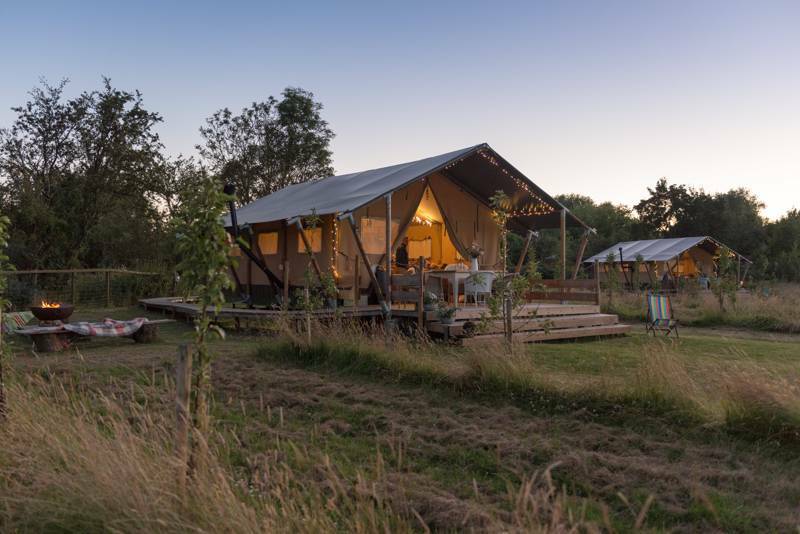 Crack open a chilled beer from the fridge within the hut and fire up the barbecue whilst enjoying the 270 degree panorama and watch the sun go down before snuggling up in the luxury cosy double bed for the night. If the weather is cooler, light the wood burner within the hut and Cook something wonderful on the gas hob, or repair to one of the many pubs and restaurants nearby. In the morning, wake up to the sun beaming through your bedroom window and the bucolic serenity of the sheep in the field outside. Go and collect some free range eggs for your breakfast from the hens outside the hut. The hut is available for short breaks (Min 2 nights) for 2 people (no pets). We can offer this as standalone rental or as an add on to our holiday cottage (6+2). So why not invite a couple of friends to join you on holiday during your stay at the cottage? 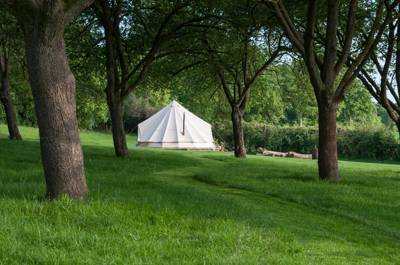 For latest availability and best prices for Upper House Glamping, please use the Date Search above. The hut features a new luxury Divan double bed (all bedding provided), cooker, fridge and sink with hot and cold water. There's an ensuite electric shower, with basin and flushing loo within the hut (Mason & Miller complimentary toiletries pack included), woodburner, fibre broadband speed WiFi, and 240v mains electric sockets with USB ports for charging devices. Outside BBQ and fire pit, bike store, wildlife pond adjacent, Lafuma lounger chairs and table tennis available, plus a luxurious Zoki sauna only 20 yards from the hut with an outdoor solar shower. There are some nice walks and cycle routes straight from the hut, but if you fancy something a little more energetic, the Forest of Dean and Wye Valley offers some of the best walks and mountain bike trails in the UK. Canoeing, archery, climbing, horse riding, caving, and fishing are also on offer. To the east, the Malvern Hills, divides Worcestershire and Herefordshire, and is a great destination for walkers of all ages and abilities, whether you are interested in a gentle stroll along tree-lined paths or a trek along the Malvern Hills ridge. The local area boasts a wealth of historic sights, including three magnificent castles (Berkeley, Eastnor, and Goodrich), whilst there's plenty of quaint villages and towns to while away a few hours. Finally, family-run Alexander Park Resort offers relaxing spa treatments, golf course and a gym, all nestled within mature meadows. Inside the hut there’s a fridge, 2-ring gas hob, kettle, various pans, cutlery, plates, bowls and mugs – so everything you need to cook a decent meal. You will also find a sink with hot and cold water for washing up. Alternatively, bike or walk to the lovely market town of Ledbury, which is renowned for its cafes, pubs, and restaurants. If you are driving, please enter the postcode HR8 2JY. The nearest train station is Ledbury (1.5 miles), which is on the mainline to London and Birmingham. 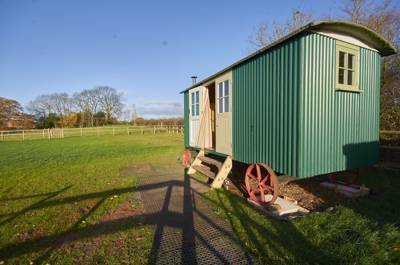 A single shepherd's hut, with endless views of the Herefordshire countryside.